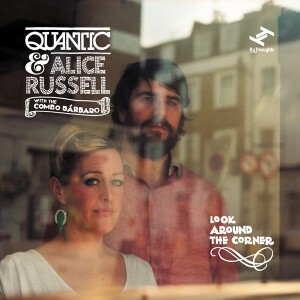 For fans of modern leftfield soul, the news that Quantic – aka producer Will Holland – and British singer Alice Russell were collaborating on a new album comes like manna from heaven. Recorded in Holland’s adopted home of Cali, Columbia, Look Around the Corner offers funky soul with a south-of-the-border twist, courtesy of Quantic’s current band project Combo Bárbaro. Mixing warm, brassy funk and soul grooves with Latin jazz and cumbia, it’s a soft sort of fusion, mixing flavours with a lightness of touch.The two go back some time – Russell lent her soulful, cosmopolitan voice to some of Holland’s earliest recordings, back in the early 00s – but their careers have blossomed since. Holland has further investigated the possibilities of ensemble play, while Russell has been collaborating with the likes of TM Juke, Mr Scruff and David Byrne andFatboy Slim, contributing a track to their Imelda Marcos-themed Here Lies Love project. The title-track blends florid soul and cosmic lyrics to a swinging, funky backbeat, like Minnie Riperton’s Les Fleurs with a spot of swagger in its step. Travelling Song sets Russell’s spectacular soul voice to a Latin strut decorated with group backing vocals and warmly produced strings. But there’s trouble in paradise, too. Su Suzy ups the tempo, a barrio soul lament about a woman trapped in a violent relationship, powered by Afro-Cuban rhythms, horns that sound like a warning, and a sonic effect that mimics the sound of approaching police sirens. It is, as you’d expect, expertly played – but there’s a vividness to Look Around the Corner that reaches some way beyond mere chops. It’s an exceptional collaboration that proves there’s life in the old soul yet.